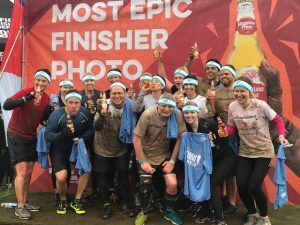 The team of 23 took on the gruelling endurance event, the Tough Mudder Half, which is designed to drag participants out of their comfort zone as they run five miles across a muddy course. If the mud wasn't enough, the group had to tackle 13 obstacles along the way, including the Block Ness Monster, a teamwork focused obstacle, which involves lots of pushing, pulling and rolling through slippery rotating barriers, Mud Mile 2.0, a narrow mud-filled trench where no one leaves with a clean outfit, and Shawshanked, a wet and cramped tunnel crawl with a five foot drop to freedom, offering no option of falling gracefully at the end. The team raised a fantastic £1,200 for their chosen charity, Brain Tumour Research. The charity seeks to improve the outlook for people with brain tumours by funding research that takes forward our understanding of the mechanisms underlying tumour development and helps develop better ways to diagnose and treat these tumours. With just one percent of the national spend on cancer research in the UK allocated to brain tumour research, the charity is determined to change this and so every little helps! If you have been impressed by the team’s dirty work, there is still time to donate. Simply click here to visit their JustGiving page.